����������Welcome to the USS Gauntlet, one of the most versatile, elite, and technoligically advanced ship in the United States Colonial Marines Corps since the USS Sulaco. Her timeline takes place about 43 years after Alien3. She is constantly in a prototypical state, being rehauled and revamped nearly every time she hangs free in dry dock. The USCMC section you'll be involved in are the Operating Forces. We're the spacefaring grunts. To survive, you'll need a lot of PFM. "What is PFM?" you might ask. PFM is Pure F*cking Magic. ����������When a sim begins, your character will begin in one of four places. His/her quarters, the gym, the mess hall, or at his/her post. You will be notified by the Commanding Officer to go to his office when he tells it in either I> form or in ACTION form. You may NOT display anything in ACTION form. ����������The USS Gauntlet is the first of three Armageddon-Class starships. The Armageddon design was first "drawn up" shortly after Lieutenant Ripley was found in an EVV in dead space. When she was found, the USCMC realized that they were in need of a versatile ship that could hold both Operating Forces and Supporting Establishment officers. This ship was said to be the ship which would finally give the USCM and the USASF (United States AeroSpace Force) "dominance of the heavens" in the Core Systems. When initial plans were drawn up, however, they were discarded at the extreme expense it would take to create these "Everest Class" starships, toppling the force at over four trillion, three hundred and fifty billion American dollars to create. Thirty years after Lt. Ripley died on the Prison Colony at Florinia 161, the USCMC Head of Operations caved in. ����������The USCMC Head of Operations agreed to construct the USS Gauntlet, if the name were changed of the class of the ship and the cost could be cut to nearly one trillion, two hundred billion American dollars. 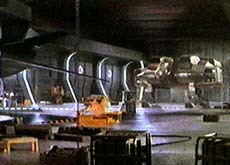 Initially, the creators of the now "Armageddon Class" starship declined the offer, stating that the Gauntlet needed the crew and the supplies to survive in the Core Systems, far from Earth. After they were forced to change the specifications of the ship, the final plans for the USS Gauntlet were created. Her construction took nearly five years to complete, mainly because Weyland-Yutani Enterprises lost major governmental influence and their interstellar operations were declining rapidly. They were able to only give the Marines 7% of the building materials they needed to construct the Gauntlet. ����������The Gauntlet's main mission here was changed. She was now out to fight the xenomorph and Predator threats against Mars, Venus, Triton, and God forbid, Earth. She was never to leave the solar system. �����Crew Content: 5200, wartime crew of 4800. Room enough to comfortably carry 6000 crew. �����Crew Division: 3200 Navy, 2000 Marine. Room enough to carry 1000 passengers plus maximum crew. �����Ship Defenses: 2 Dorsal Railguns, 4 Ventral Railguns, 1 Dorsal Particle Beam, 5 Ventral Particle Beams, 3 Centralized ����������������������������ThermoNuclear Warhead Chambers, 4 Dorsal TNWCs, 7 Ventral TNWCs. �����Ship-to-Ground Offenses: 150 IPBMs (InterPlanetary Ballistic Missiles), 70 Anti-Matter Dry-Drop guided bombs, 15 ����������������������������������������������Atmospheric Destabilizers.